In the past decade, imaging genetics has evolved into a highly successful neuroimaging discipline with a variety of sophisticated research tools. To date, several neural systems mechanisms have been identified that mediate genetic risk for mental disorders linked to common candidate and genome-wide-supported variants. In particular, the examination of intermediate connectivity phenotypes has recently gained increasing popularity since connectivity captures an important facet of brain organization and function beyond regional activation or structural measures. In the present talk, we report results obtained from applying this strategy to both structural connectivity and functional connectivity data. Using examples from candidate genes (5-HTTLPR, MAO-A), but focusing on genome-wide significant variants (ZNF804A, CACNA1C, among others), we show that systems-level connectivity networks under genetic control can be identified. Remarkable similarities are observed across modalities and scales of description, and even across species. Features of connectivity often better account for behavioral effects of genetic variation than regional parameters of activation or structure. These data provide convergent evidence for genetic control in humans over connectivity systems, whose characterization has promise for identifying neural systems mediating genetic risk for complex human behavior and psychiatric disease. Prof. Dr. Meyer-Lindenberg is Director of the Central Institute of Mental Health, as well as the Medical Director of the Department of Psychiatry and Psychotherapy at the Institute, based in Mannheim, Germany and Professor and Chairman of Psychiatry and Psychotherapy at the University of Heidelberg in Heidelberg, Germany, and he is board certified in psychiatry, psychotherapy, and neurology. Before coming to Mannheim in 2007, he spent ten years as a scientist at the National Institutes of Mental Health, Bethesda, USA. Prof. Dr. Meyer-Lindenberg is the author of more than 200 peer-reviewed articles and book chapters in journals such as Nature, Science, Nature Neuroscience, Nature Medicine, Nature Reviews Neuroscience, Neuron, PNAS, and others. 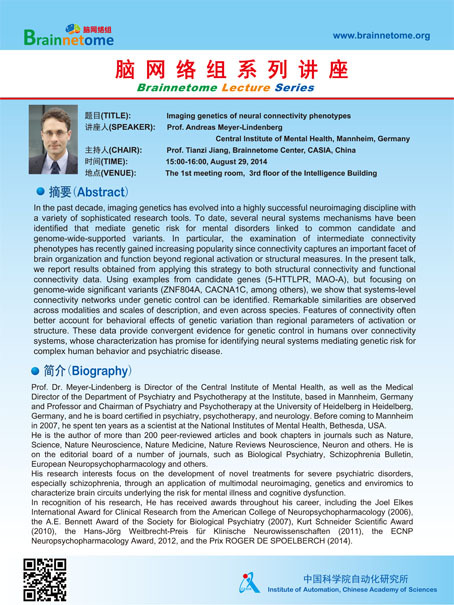 He is on the editorial board of a number of journals, such as Biological Psychiatry, Schizophrenia Bulletin, European Neuro­psycho­pharmacology, Psychiatry Research: Neuroimaging, and Neuroimage. In recognition of his research, Prof. Dr. Meyer-Lindenberg has received awards throughout his career, including the Joel Elkes International Award for Clinical Research from the American College of Neuropsychopharmacology (2006), the A.E. Bennett Award of the Society for Biological Psychiatry (2007), Kurt Schneider Scientific Award (2010), the Hans-Jörg Weitbrecht-Preis für Klinische Neurowissenschaften (2011), the ECNP Neuropsychopharmacology Award, 2012, and the Prix ROGER DE SPOELBERCH (2014).